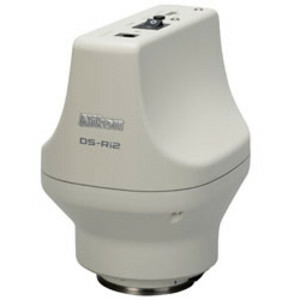 The Ds-Ri2 is a 16.25 MP, high-definition colour camera from Nikon providing good colour reproduction and fast frame rates. The CMOS sensor (36 x 23.9 mm images size) enables one-shot capture of high-definition images. It is designed to allow faster imaging than pixel shift imaging comprising multiple-shot images, and to reduce vibration during image capture. The camera is suitable for brightfield imaging of pathological samples, which require high-colour reproducibility. The large pixel size (7.3 µm pixel pitch) allows weak light to be captured by each pixel and the low-noise circuit design is optimised for microscope imaging. With the USB 3.0 and CMOS sensor, which provides high-speed data readout, the product has a frame rate of 45 fps (1636 x 1088 pixels). 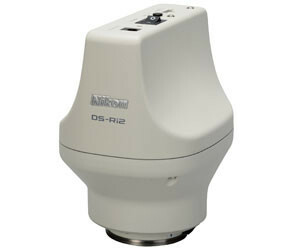 This enables fast live-image display and easy observation point selection and focusing. I am interested in Nikon DS-Ri2 colour digital camera .